The question was about how attractive the Knicks – currently the NBA’s worst team and on a 17-game losing streak – might be to free agents this summer. It was posed to Reggie Miller, one of the most notorious opposing villains in franchise history. Uh-oh. “This would be the perfect opportunity for me to further bash my beloved Knicks,” Miller said ona conference call Tuesday to promote Turner Sports’ coverage of the NBA All-Star Game on Sunday. “I think it’s been somewhat of a culture change within that organization, and to me it started in that front office,” Miller said. “I think the hiring of Coach [David] Fizdale has helped tremendously, because I think that’s going to be a part of whoever they go after this summer. “Will they get the ones that they are projecting in Kyrie [Irving] and Kevin Durant? That remains to be seen, but for them to be able to clear their salary cap and show the Knicks faithful and their fan base that they are at least trying is a step in the right direction. “The key is going to be, when they have all this money, giving it to the right players, because there are a couple of free agents out there that if you give them the max deal, I’m not quite sure it solves your problem. Chris Webber, Miller’s fellow Turner analyst, also said the Knicks are in good position to make a move this summer. “I actually think that [general manager] Scott Perry has come in there and things have been a little bit more quiet on the drama side," Webber said. "I think it has allowed some free agents to consider New York. I think they’re in a better position, but what is that comparable to? “I do think that now it seems to have some consistency, even though it’s been less than a year. It seems they’re on the path to consistency. It seems that there’s positive talk out of the locker room, even from guys that are getting traded. We know they’ve cleared cap space and they’re going after some pretty big free agents . . . I would not be surprised if New York landed a [major] free agent this summer. I would not be surprised at all. 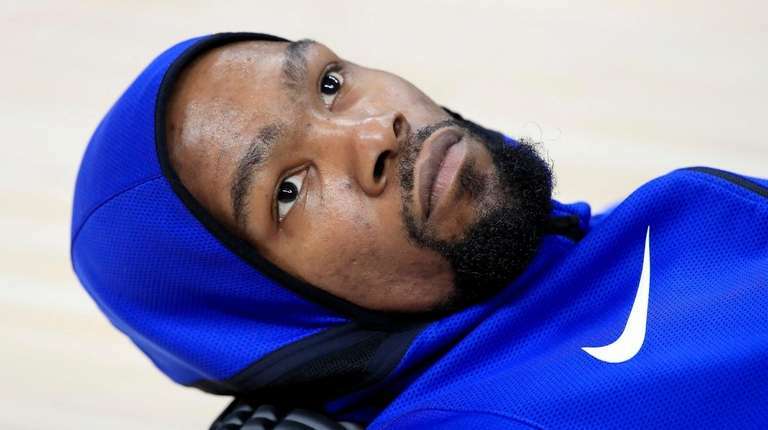 The most attractive potential acquisition is Durant, who recently held a contentious news conference in which he took issue with some of what had been written about his potential departure from the Warriors to New York. “Here’s my question: If he's a little surly and upset by what an Athletic writer wrote, he has a couple of bad games in New York under that microscope, he’s really going to be upset,” Miller said. “So you have to factor in everything when you’re considering joining the New York Knicks, the No. 1 media market in the world and in our game. “You can’t be upset with the media when you’re back-to-back NBA Champion and back-to-back Finals MVP. You think the kitchen is hot now, joining the Knicks, the expectations that are going to follow with that, there’s a lot that comes with it. That’s why you have to factor in not only the money, but you have to factor in the lifestyle, the winning. “I’m sure K.D. does think, ‘Yeah, if I went there, of course if you got help, yeah, I can turn this franchise around.’ But there’s expectations that come with that and we know how the New York media can be. Said Webber, “Players are friends with athletes in other sports, when you see how maybe an Odell Beckham [of the Giants] is treated fairly or unfairly by the media. But in this day that you can control your message on social media as well, I think the players look at it maybe differently and maybe they’re encouraged by family, friends, especially if they’re from close to those areas, or by the shoe companies. “I wouldn’t be surprised if someone took the risk, because at the end of the day it’s still basketball. I think Reggie makes fair points about Durant and the fact that if you get upset with the media anywhere else then this might not be the place you want to come. “I think New York, besides the media package – I hate to keep saying that, but that’s the reality – it should be one of the easiest places to recruit, because whether you’re an opponent there or a player there that played pretty well, you get love in New York.